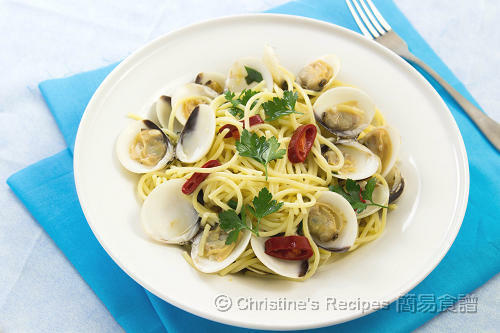 This spaghetti with clams is a classic Italian pasta dish, suitable for any day throughout the year. If you’re too busy to afford any time standing in the kitchen, yet still want good food served on dinner table, this is the one for you. It’s downright easy, only takes 20 minutes or so to make. Oh well, except the soaking time of clams. If using frozen clams, they are often cleaned so thoroughly without any sands inside, just pop them in a pot of boiling water. Then blend the clams with the cooked spaghetti. Its taste is so good than you thought if you haven’t had a chance to try before. Soak the clams in salted water for 3 hours and let them release sands inside. Rinse and blanch in boiling water until they are slightly open. You don’t need to cook through them at this stage. Drain them in a colander. Set aside. In a large pot of boiling water, add 2 teaspoons of salt. Cook the spaghetti until al dente according to the instructions on packaging. Drain in a colander. No need to rinse the spaghetti. Reserve one cup of cooking spaghetti water for later use. While cooking spaghetti, heat butter and olive oil in a large pan over medium high heat. Saute garlic, red chilli, basil, spring onion and half of the parsley until aromatic. Add in the clams. Pour in the white wine. Cover and cook for 2 minutes, or until all the clams are open. Toss in the spaghetti. Stir to combine. Add some of the reserved cooking spaghetti water to adjust the sauce. Season with salt and pepper. Sprinkle some olive oil if needed. Add the remaining parsley. Serve immediately. You might like to use either fresh or frozen clams. 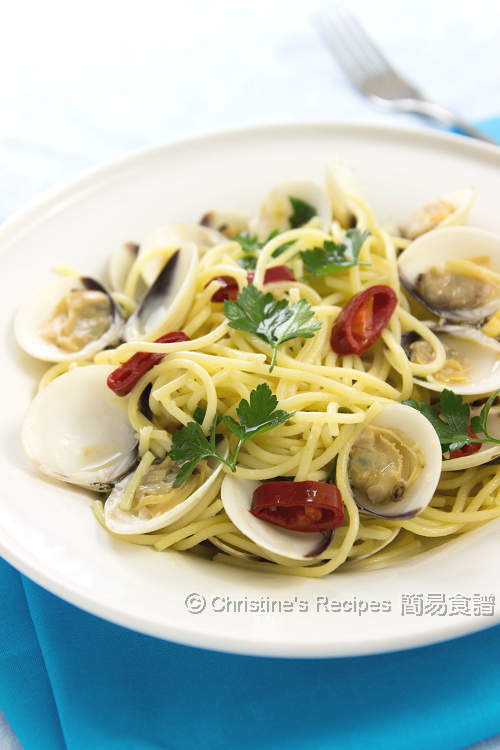 I love whole clams as the spaghetti and sauce will take up more flavours. 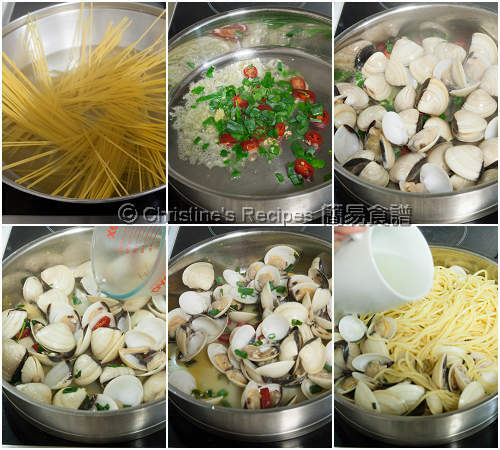 To make a kid friendly version, remove the shells and only use calm meat to cook with spaghetti. To get the best results, use fresh parsley, not the dried one. Happy New Year Christine. 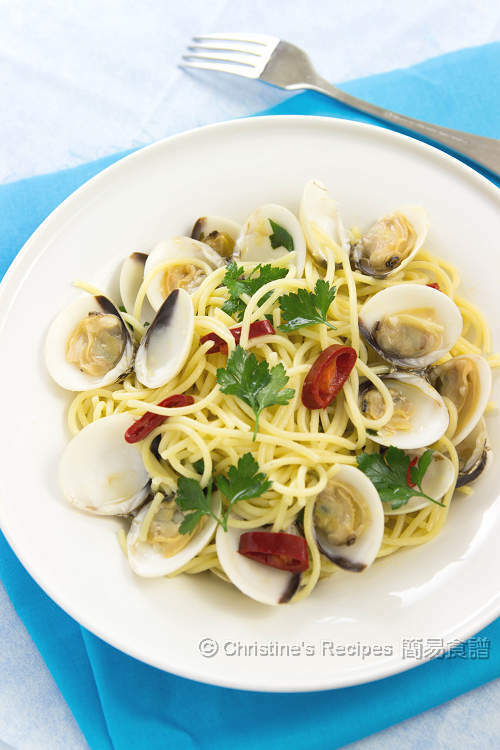 Your spaghetti with clams must be full of flavour. Simple and easy, yet delicious. Thanks for sharing. My pleasure. Hope you like this dish as much as we do.